Sie sind der 251 Besucher. 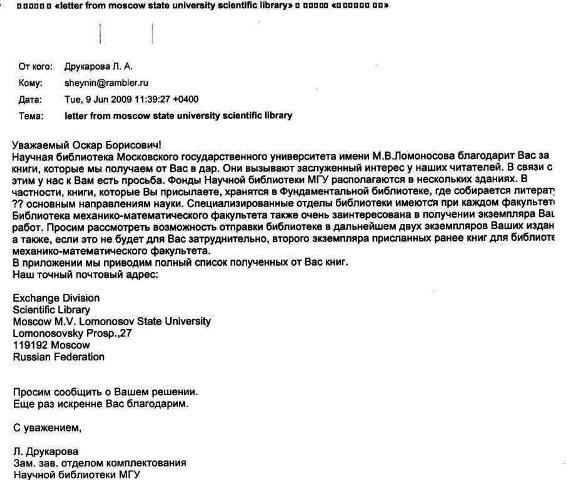 Dear Oscar Borisovich, The Scientific Library of the Moscow State University thanks you for the books which we receive from you for free. They deservedly interest our readers and in this connection we have a request to make. Our books are kept in several buildings and in particular your books are in the Fundamental Library where we collect literature belonging to the main fields of science. Each faculty has its own specialized section, and the library of the Mechanical-Mathematical Faculty is also very interested in getting a copy of your works. We are asking you to consider the possibility of sending us two copies of your future publications and if not difficult a second copy of those that you have already sent us for the library of that faculty. Attachment: a complete list of books received from you. Our exact address [�]. Please let us know your decision. Once more, sincere thanks. With respect, L. Drukarova, Assistant head, sector of acquisitions, Scientific Library, Moscow State University. 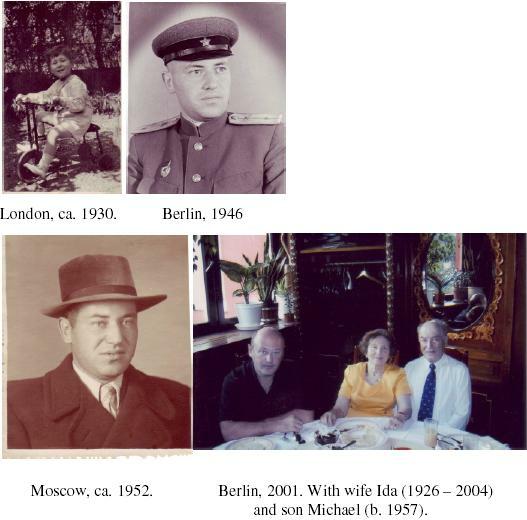 My biography: see downloadable files 32 (Russian), 90 (English). For more than 30 years now, I have been studying the history of probability, statistics, and error theory and working in this field as a free-lance researcher. I am greatly indebted to the late Professors Youshkevich, whose kindness greatly inspired me, and Truesdell, who published some 25 of my papers in his periodical in spite of my earlier linguistic deficiency. 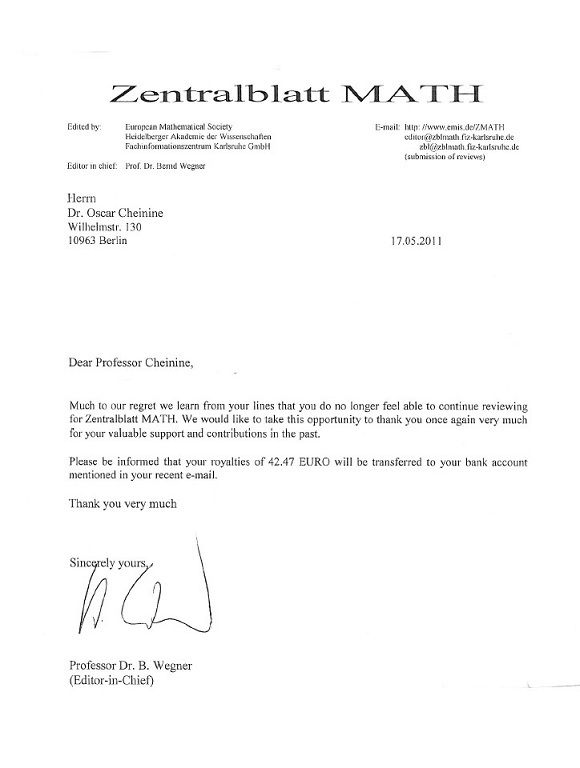 After my emigration to Germany, Professor Pfanzagl made me at home at the Math. Inst. in Cologne and I regret indeed that we are now living apart from each other, in Cologne and Berlin resp. My achievement. This consists in a systematic description of the history of probability, of statistics together with its application to natural sciences, and of the theory of errors to the time of Kolmogorov and Fisher. In the process, I made many discoveries. These concerned Kepler; Lambert; Bayes; Daniel Bernoulli; Euler; Laplace; Poisson; Abbe; Bessel; Helmert, L�roth; Nekrasov; and Chuprov. I also mention my study of stochastic notions in the Bible and the Talmud and my lone but successful defence of Euler and Gauss against a free-and-easy slandering attack launched by a contemporary statistician. Finally, I found out that Chinese astronomers had discovered sunspots not later than in the 13th c. (Journal, vol. 99, 2005, p. 83). Reprints of some papers on the history of probability; of statistics; and of the theory of errors are still available upon request.